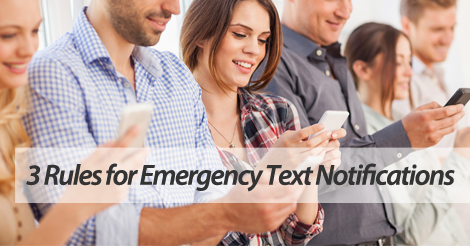 Our mass texting service makes sending out emergency alerts and SMS notifications a breeze. We respect your sense of urgency, and want to help you communicate with recipients in an immediate and efficient manner. With that said, follow these 3 rules when drafting up your mass texting campaign. Why are you sending out this mass emergency notification? That’s your “problem.” For example, “severe weather warning” is a problem. “Fire in the East building” is a problem. Just so you can keep the facts straight, state your problem right from the get go. That should be the first portion of your message. Be clear about a solution. Don’t be vague. In a crisis situation, you need to be immediate and direct. State your solution to the problem. Offer clear direction. Don’t make it too lengthy or overcomplicated. You want to make sure everyone reads and understands your message. This adherence to simplicity could save lives in an emergency situation. Express a specific level of urgency. Is this a life threatening situation? Or maybe just a quick notification? Make sure you clearly express the desired level of urgency. For example, let’s say there’s a fire sweeping across campus. Here’s an example of what not to do. Incorrect: Please evacuate campus grounds until further notice. Now, here’s the correct way to communicate this urgent information. Correct: All students evacuate campus IMMEDIATELY. There is a fire in the East Building. Stay tuned for further instruction. Join forces with top mass texting service, SlickText.com. When it comes to emergency text notifications and reliability, you can count on us. Give us a buzz at 1.800.688.6290 to learn more, or head over to the pricing page and sign up for your free plan. Our efficient and reliable platform is the #1 mass texting service for colleges, organizations, and large scale institutions nationwide.